Best Time to Murchison Falls? Also referred as Edward Nyanza or Rutanzige and traditionally as Mwitanzigye (killer of locusts), Lake Edward is considered the smallest of the many African Great Lakes and is situated within the floor of the Albertine Rift Valley region, the western arm of the Great/East African Rift that lies on the Uganda-Democratic Republic of Congo border overlooking the legendary Mountains of the Moon (Rwenzori Mountains) with the highest snow-capped peak rising to 5109 meters above sea level. The Northern shores of Lake Edward are some few kilometers south of the Equator and has numerous primary inflows including Rivers Lubilia, Nyamugasani, Rutshuru, Ishasha, Ntungwe and Rwindi while it empties its waters to the north through River Semliki into Lake Albert. 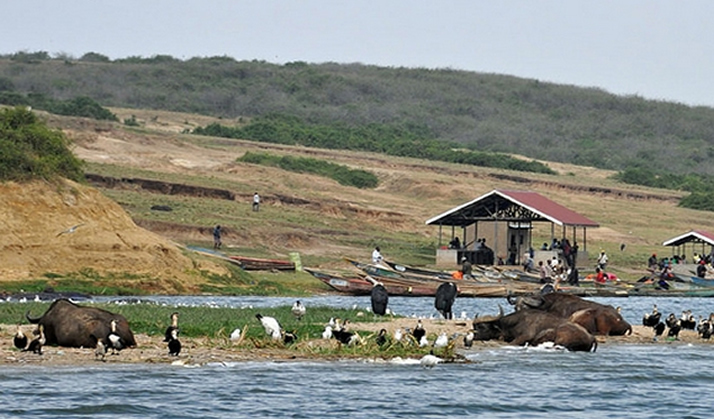 Located within Kasese District in western Uganda, the total Surface Area is this Lake is 2325 square kilometers (898 square miles) while its maximum length is 77 kilometers (48 miles), width is 40 kilometers (25 miles) and is about 112 meters (367 feet) deep. There are two National Parks bordering the shores of Lake Edward and they include Virunga National Park in the Democratic Republic of Congo (the north-western shores of the Lake) and the Queen Elizabeth National Park (north-eastern shores). This spectacular Rift Valley Lake lies at an altitude of 920 meters (3020 feet) above sea level and is the 15th largest Lake within the African Continent. However, the western escarpment of the Great Rift Valley stands at an elevation of 2000 meters (6600 feet) above sea level rising above its southern and eastern shores that are generally characterized by flat lava plains. Tourists who visit this Lake are rewarded with the breathtaking views of the Rwenzori Mountains that are only 20 kilometers (12 miles) north of the Lake. Just like most beautiful attractions in the African Continent, Lake Edward attracted the interest of popular European Explorers including Henry Morton Stanley who is said to have first seen the Lake in 1888 during the Emin Pasha Relief Expedition. This Lake was named after Prince Albert Edward, Prince of Wales and son to then British Queen Victoria who later became King Edward VII. However, it was renamed Lake Idi Amin by the Uganda and Zaire Government (former Democratic Republic of Congo) in 1973 after former President of Uganda-Idi Amin Dada but after he was overthrown in 1979, it regained its original name. In the past 500 years, a number of volcanic activities were recorded within the region, with the two immense ones being Bunyaruguru Volcanic fields near a 32-kilometer long Kazinga channel on the north-western edge of the Lake and the Katwe-Kikorongo volcanic fields. Lakes George and Edward that are adjacent to each other were one of the larger Lakes in the past but the Lava that flowed from the nearby fields as well as the Maya-ya-Moto and Nyamulagira Volcanoes flowed in and separated the two, leaving the Kazinga Channel that connects the two. 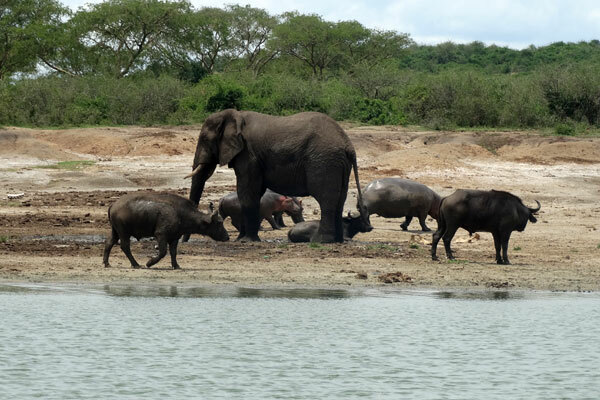 There are several animals that live or visit the banks of Lake Edward and they include elephants, buffaloes, crocodiles, lions, antelopes and chimpanzees that are generally protected within Queen Elizabeth National Park. Not only that, the Lake and its surrounding areas are haven to numerous migratory and perennial species of birds. Also, Lake Edward offers shelter to several fish species including over 50 species of Haplochromis, 25 species of Haplochromine, Bagrus docmak, Sarotherodon leucostictus and Sarotherodon niloticus and many others, hence making fishing one of the most important activities among the local residents. 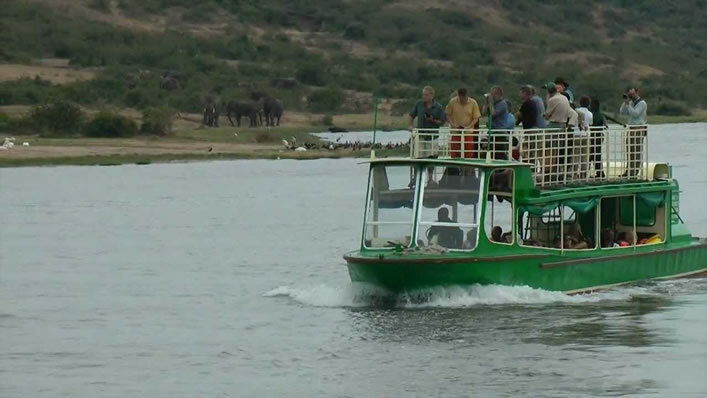 In addition to Lake Edward, Queen Elizabeth National Park is famous for other beautiful places worth exploring that include the Ishasha sector (known for the tree climbing lions), Kyambura gorge (home to the Chimpanzees), Kasenyi Plains, Lake George, Maramagambo forest, Mweya Peninsula and the Kazinga Channel. At the beginning of this year, my longtime friends I and my husband took a honeymoon trip to a place we had never been before. This actually still remains my memorable day ever in my life. I had never been to an African country before and I did not know how beautiful Africa was but Uganda truly gave me a true portrait of Africa. It really proves that Africa is the most blessed continents on the globe. 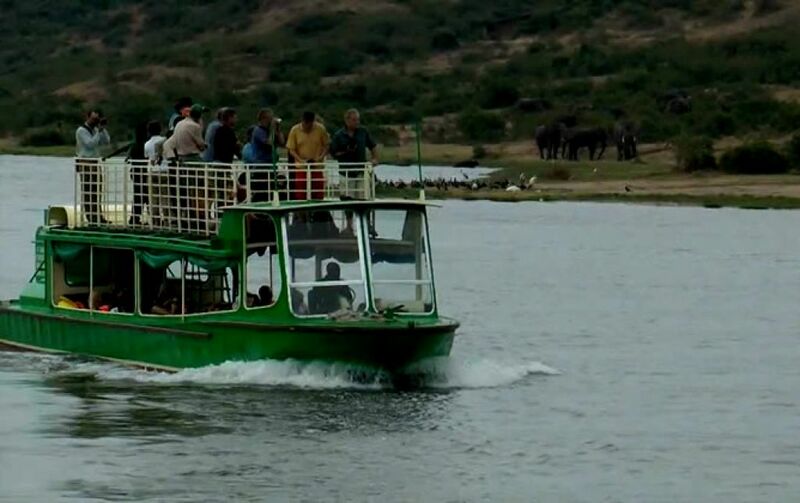 On the day when our friends surprised us with the good news about the package, we really had to hit the internet to look for a good tour company in Uganda that would organize our trip at affordable prices and other benefits and also to hire a car in Uganda that we would use to travel to our destination. As we were in Uganda, we took an expedition to Queen Elizabeth national park in Western Park the home of animals and birds. I had never seen such playful and friendly creatures like elephants, hippos as well as antelopes before. As which reached the Mweya sector, we went down through large expanse of savanna grassland in search of these animals and rare bird species. Hiking through the some of the rain forest was very tiresome but this was a thriller and adventurous as we spent 5 hours searching for the bird species. We were very excited to see birds like Bar-tailed Godwit, Black-rumped Buttonquail, Shoebill, African Skimmer, Lesser plus Greater Flamingo, Chapin’s Flycatcher, White-tailed Lark, Corncrake, Pinkbacked Pelican, Verreaux’s Eagle Owl, Papyrus Canary, White-winged Warbler, African Broadbill which are very rare in our home country. After three days at Mweya, we proceeded to kyambula where we spent one hour with amazing elephants and red eyed monkeys but this was not all about looking at these animals, this went beyond as we learnt a lot of things about elephants as well as Uganda cobs. These are animals behave like humans in the way they associate with each other and the silver back is the leader and the protector of the family. Everything done within the family revolves around the silver back. It was a life time experience that I can never forget in my entire life. I saw things that I had never seen before an animal well organized like humans, having a head animal that directs them where to go and what to do. After finishing a long conversation with these amazing animals, we headed to the most amazing part of Uganda with wonderful physical features. What amazing lake is Lake Nyungu! A lake that has a shape of map of Africa, Lake Kigere that has a human foot like shape, I really recall it was a fantastic experience one can never forget. I remember my husband confusing me with identical twin lakes around Lake Nyungu. Those lakes explain exactly how twins look like. Later in the evening, Kichwamba cultural site where my husband participated in amazing culture dances with local people. We could even here amazing voices of hissing sounds of small insects and tinny reptiles while feeling warmth from the camp fire. In the following morning, we took a canoe ride Kazinga channel as we popped some champagne while on the ride. In my opinion, Queen Elizabeth National park Uganda is the best place for the lovers to spend their honeymoon due to its natural setup. 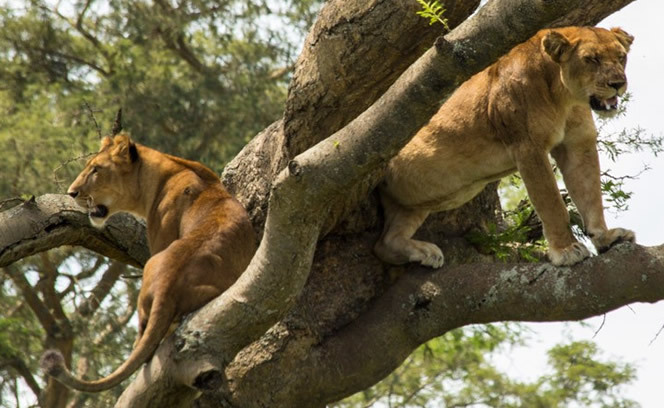 The Ishasha Sector of Queen Elizabeth National park is a home to tree climbing lions. Once you visit the is park, don’t ever miss out a game drive in Ishasha sector for tree climbing lions along side other animals like Elephants, Buffalo, Antelopes and many Savannah bird species. We stayed at Ishasha wilderness camp where we had a fantastic guided nature walk through the park. The park can be accessed by road from Kampala via Masaka-Mbarara and this Journey takes 6-8 hrs drive. 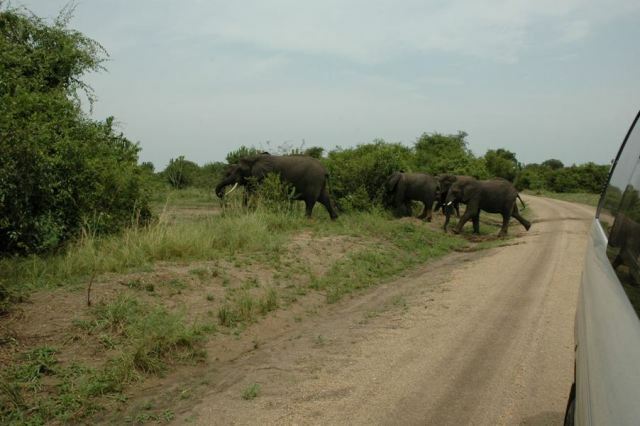 You can book an all-inclusive tour to the park through tour companies, or if you want to drive your own adventure, you will hire a car in Kampala or Entebbe. The park can also be accessed by air to Kihihi or Kasese airstip. It is about 50 minute flight. How To Access Bwindi Impenetrable Forest National Park?